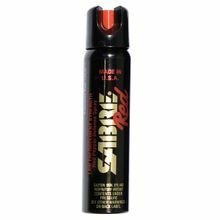 Sabre Red Large 4.36 oz Can, Stream Spray output. Very Strong! 2 Million Scoville Heat Units formula of OC and UV Marking Dye. Heavy Stream Spray pattern with a range to 12 feet. The Magnum 120 contains 4.4 oz of SABRE RED protection and delivers up to 75 shots at a range of 10-12 feet. The magnum line is perfect for individuals and public safety officers requiring larger sizes. Each can good for 35 bursts. Works while upside-down. Contains ultraviolet dye to aid in suspect identification. Fires in a stream spray to maximize distance and reduce blowback. Quick effect, lasts up to one hour. Trusted and used by law enforcement professionals all over the world, like NYPD and more. Cannot ship to NY, MA, WI, HI or AK. No PO Boxes, No APO, FPO.